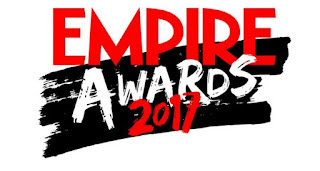 London, 19 March 2017: The winners have been revealed for this year's Three Empire Awards, which celebrates the best in film and entertainment of the past year, as voted for by movie fans. The latest instalment from the Harry Potter wizarding world, Fantastic Beasts And Where To Find Them, picked up the most awards on the night with four accolades in total, including Best Actor presented by Three for Eddie Redmayne's performance as Newt Scamander, Best Production Design, Best Costume Design and Best Make-Up And Hairstyling. The force was also strong for Rogue One: A Star Wars Story, which scored a hat-trick, claiming the coveted Best Film presented by Sky Cinema award as well as Best Actress presented by Three for Felicity Jones and Best Director presented by VUE Entertainment for Gareth Edwards. British film triumphed, with Ken Loach's I, Daniel Blake taking home Best British Film presented by The Hollywood Reporter and Best Male Newcomer presented by Pure Organic for Dave Johns' performance in the lead role, while the Oasis production Supersonic picked up Best Documentary presented by Green Tomato Cars. The 22nd annual awards also bestowed three honorary titles during the evening: Tom Hiddleston received the Empire Hero award presented by Three; Luc Besson picked up the Empire Inspiration award; and Sir Patrick Stewart took home the Legend award. In addition, Anya Taylor-Joy won Best Female Newcomer presented by London Hilton on Park Lane for her performance in The Witch. Other films which took home awards included:The Greasy Strangler, which won Best Comedy presented by Absolute Radio; The Witch, awarded Best Horror presented by Monkey Shoulder; Bourne, which won Best Thriller presented by MCM Comic Con; A Monster Calls, which took Best Sci-Fi/Fantasy presented by Three; Deadpool received the Best Screenplay award;Finding Dory was named Best Animated Film; La La Land won Best Soundtrack; Doctor Strange received Best Visual Effects presented by VUE Entertainment, and Inner Workings was awarded Best Short Film. The accolade for Best TV Series presented by Magic went to The Night Manager and the Best Game award went to Uncharted 4: A Thief's End. The Three Empire Awards 2017 was hosted at Camden's Roundhouse, the event's first time in the venue. In attendance were nominees, presenters and other distinguished guests from the entertainment world including: Hugh Laurie, Dame Joan Collins, Sir Ian McKellen and Dan Stevens. Empire's Editor-In-Chief Terri White commented: "Once again, the Three Empire Awards stands out as the awards ceremony that truly reflects the feelings of film fans. From Rogue One to Fantastic Beasts and Deadpool, we were thrilled to be able to recognise the films that packed out cinemas last year. Not only that, but we recognised some of the biggest and most exciting talents in the industry today, naming Tom Hiddleston our Hero, Sir Patrick Stewart our Legend and Luc Besson our inspiration. What a night!"